AP Photo | New York Yankees starting pitcher Masahiro Tanaka warms up during the first inning of a spring training baseball game against the Philadelphia Phillies Tuesday, March 29, 2016, in Clearwater, Fla. This could be the strongest American League the sport has seen in years. Emerging young stars like Dallas Keuchel and Francisco Lindor are entering their primes. Lineups – like the Blue Jays nine – are frightening from top to bottom. Teams from all three divisions had stellar offseasons, the likes of which could go down in baseball history. Not only does the AL have the reigning champion Kansas City Royals, but a Cleveland Indians team poised for a breakout year and a Boston Red Sox squad that’s reminiscent of the one that made the immaculate run in 2004. But if there’s one thing for certain: this will be fun. Like it or not, the AL East will have two teams in the postseason this year. Remember those old, beautiful pennant races between the Sox and Yankees in the early 2000s? It’s shaping up to be that way again, but between the Sox and Toronto Blue Jays. Boston said goodbye to liability starter Wade Miley this offseason and brought in David Price and one of the best closers in the game in Craig Kimbrel. Mix that with a lineup stacked with phenoms (Xander Bogaerts, Jackie Bradley Jr. and Blake Swihart) and it’s dangerous. But the problem? Hanley Ramirez and Pablo Sandoval, coming off majorly disappointing $145 million seasons, will have to perform for the Sox to take the division. That’s why Toronto will hold on. Coming off their first playoff appearance since 1993, the Jays have a new attitude and a new general manager (Ross Atkins.) The lineup, with Jose Bautista, and Josh Donaldson, and Edwin Encarnacion, and Troy Tulowitzki, is scary good. And the rotation is more than serviceable, with a possible CY Young candidate in 24-year-old Marcus Stroman. Move over, Kansas City. This is the Indians’ year. At the top of the rotation, Corey Kluber just keeps getting better. Even though he didn’t repeat his 2014 Cy Young performance last year, his WHIP was lower and his K/9 ratio was ranked fourth in the AL. And he’s backed by Danny Salazar and Carlos Carrasco – both guys who can win games every time out. The lineup has one of the game’s best prospects in Francisco Lindor, who will have a full season to show fans what he’s made of. The Indians’ chances are even better because the Royals have regressed a bit. Johnny Cueto left to the San Francisco Giants. Ryan Madson is gone so there’s no more three-headed monster in the pen. And Edinson Volquez will have to front a huge workload that he might not be capable of carrying. The West is shaping up to be one of the more interesting divisions in baseball. The Houston Astros, formerly the most boring team in baseball, have two superstars in the making in reigning Cy Young winner Dallas Keuchel and 21-year-old slugger Carlos Correa. Some forget that on their way to the AL Division series, Houston also had a 19-win starter (Collin McHugh) and one of the best power lineups in baseball. The Texas Rangers also look strong, but not enough to win the division again. There are just too many questions; will Yu Darvish be his pre-Tommy John self again? Who will fill the workload gap left by Yovani Gallardo’s departure? Are Adrian Beltre and Prince Fielder approaching the downside of their careers? Keuchal will be in the Cy Young conversation again and Correa will lead the AL in several offensive categories. This team is strong all around, and matches up great against the Cubs. 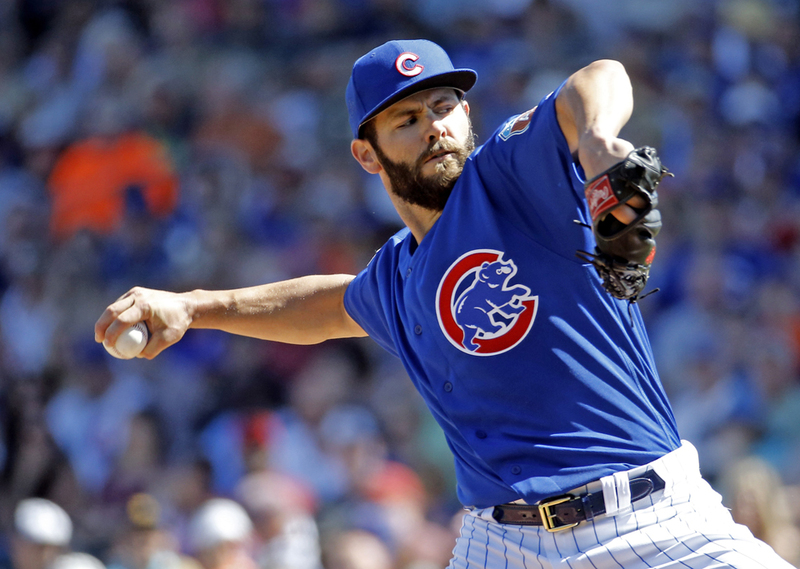 AP Photo | In this March 9, 2016, file photo, Chicago Cubs’ Jake Arrieta throws during the first inning of a spring training baseball game against the Cleveland Indians, in Mesa, Ariz. The Cubs, a season after getting swept by the Mets in the NL Championship Series, acquired outfielder Jason Heyward, starter John Lackey and all-purpose player Ben Zobrist. They joined Cy Young winner Jake Arrieta and young boppers Kris Bryant, Anthony Rizzo and Kyle Schwarber on a team clearly dressed for success. If this old sports adage hadn’t been proved right so many times over the years, the Chicago Cubs would have already been declared 2016 National League Champions before the first pitch has been thrown. On paper, the Cubs look to be the best team in baseball due to their powerful lineup and strong pitching rotation, but along with that comes lofty expectations and a huge target on their backs. Kris Bryant, Kyle Schwarber, Anthony Rizzo Addison Russell, Jorge Soler and Javier Baez are some of the best young players in baseball. Pair them with guys like Jason Heyward and Ben Zobrist and out comes a lineup to drool over. But let’s go division by division and look at the teams providing the toughest competition for the Cubs in capturing the NL Pennant. The returning National League Champion Mets look poised for another deep run through the postseason and pose the biggest threat to ending the Cubs’ 71 year World Series drought. The Mets boast an impressive pitching staff and a lineup that includes David Wright, Yoenis Cespedes, Curtis Granderson and Michael Conforto. Competing for the NL East title will be the Washington Nationals — arguably the most disappointing team in 2015. However, the talent is there and if the Nats can get things straightened out, the NL East divisional race will be the most exciting in all of baseball. The Cubs play in the ultra-competitive NL Central where they are going to be pushed all year by the St. Louis Cardinals and Pittsburgh Pirates. The Cardinals are the standard when it comes to consistency in the MLB and with Matt Carpenter, Yadier Molina and Adam Wainwright sticking around to keep this core intact, the Cardinals cannot be counted out for another championship season. The Pirates? Well, their offseason didn’t create much of a buzz in the Steel City. Pittsburgh is the big question mark in this division due to its composition of washed up veterans playing alongside young players who have yet to hit their prime.Really, the only exception is Andrew McCutcheon. Maybe Jonathon Niese and David Freese will revive their careers. Maybe Gregory Polanco, Starling Marte and Gerrit Cole will all have record years. Or, maybe, the Pirates will fail to meet the climbing expectations of their fans and struggle to keep up with the Cubs and Cardinals. Who really knows? Does anyone actually watch the NL West? Seriously, this division has got to be the dullest division in baseball. The last few years it has been a two team race between the Los Angeles Dodgers and San Francisco Giants. This year many people are trying to add a third horse, the Arizona Diamondbacks — but they are more of a foal. The Diamondbacks are the most improved team in the division with their acquisitions of Zack Greinke and Shelby Miller. However, this team is still young and relies too heavily on their stud first basemen, Paul Goldschmidt. The Dodgers lost Greinke, but are still the deepest team in the division. In order to fill the void they snagged Scott Kazmir and Kenta Maeda who should be able to solidify the rotation alongside ace Clayton Kershaw. The Cubs last World Series Championship was in 1908. It’s time for the drought to end and it’s time to start chugging that Cubs Kool-Aid.